Dr. Chavez welcomes new patients and offers a new patient consultation for $49. This exam is like no other. Dr. Chavez spends 60 to 90 minutes with every patient and it is very thorough. The most comprehensive exam anyone has ever had! Call (830) 201-3330 or click here to schedule your new patient exam with Dr. Chavez. 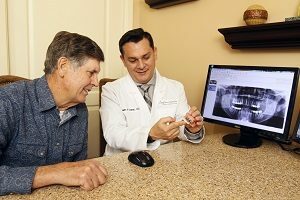 Dr. Chavez offers an implant consultation for $49. Call (830) 201-3330 or click here to schedule your implant consultation with Dr. Chavez. Dr. Chavez offers a Full-Mouth Reconstruction consultation for $49. Call (830) 201-3330 or click here to schedule your full-mouth reconstruction consultation with Dr. Chavez. Dr. Chavez offers a Cosmetic consultation for $49.